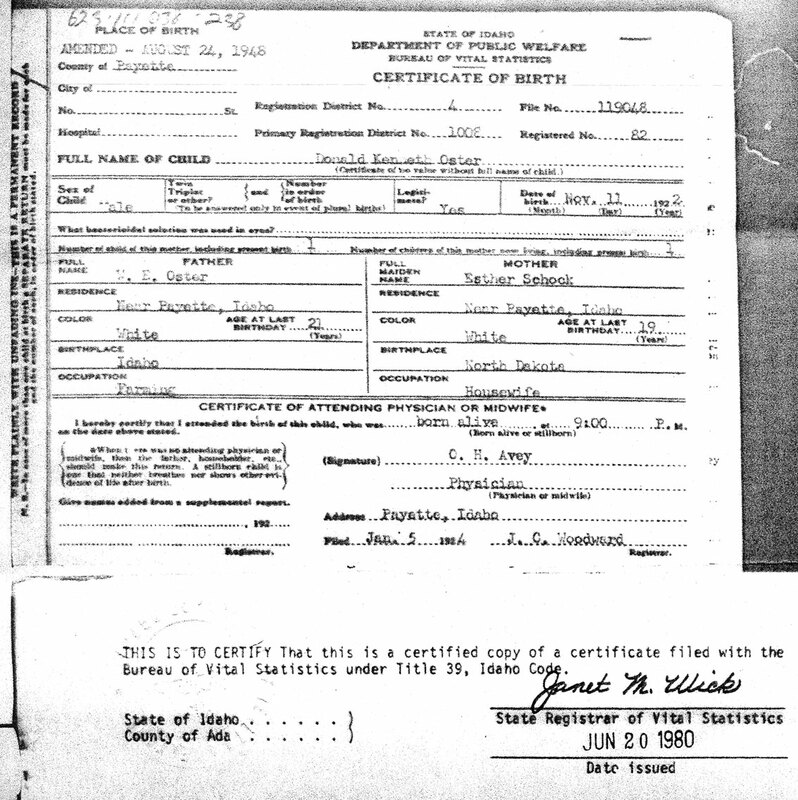 Wendlin Ernest Oster Junior’s birth was announced in the Payette Independent on Thursday, April 24, 1902. 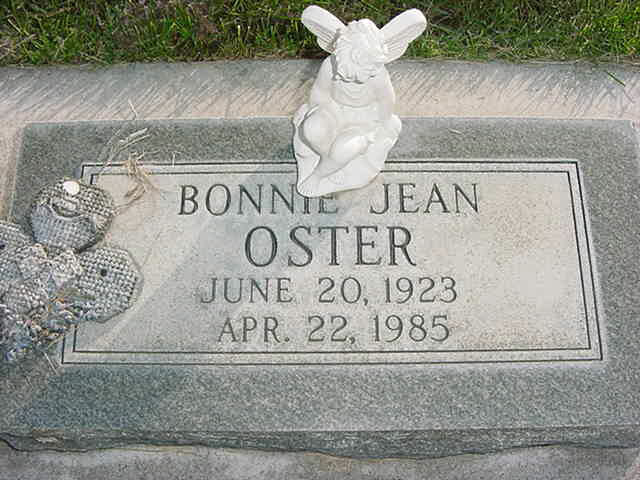 It read "Born Monday, April 21, to Mr. and Mrs. Oster, a son." 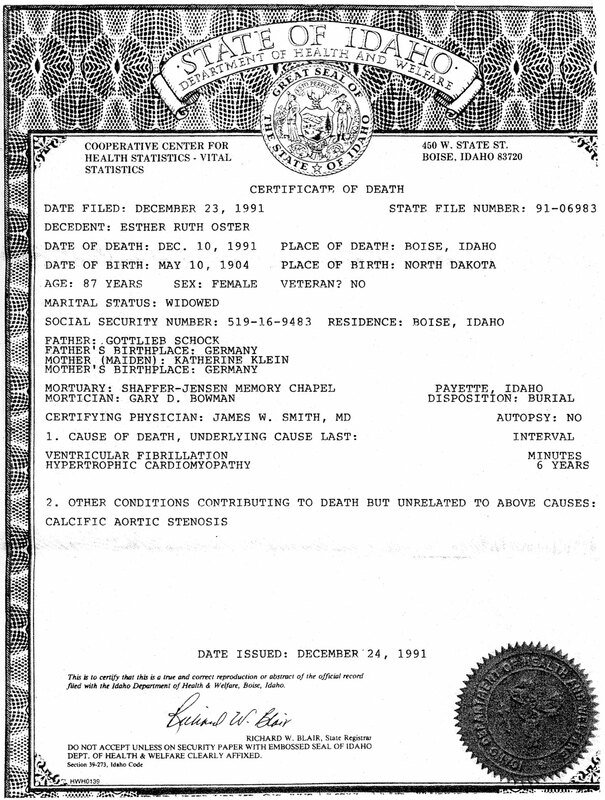 Wendlin was raised in Payette, Idaho. In 1922, he married Esther Ruth Schock. 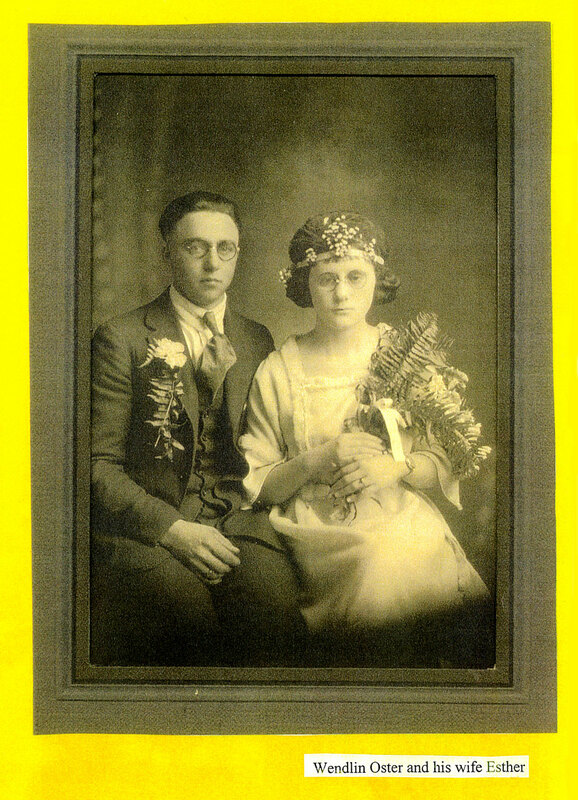 They had their first child on November 11, 1922. 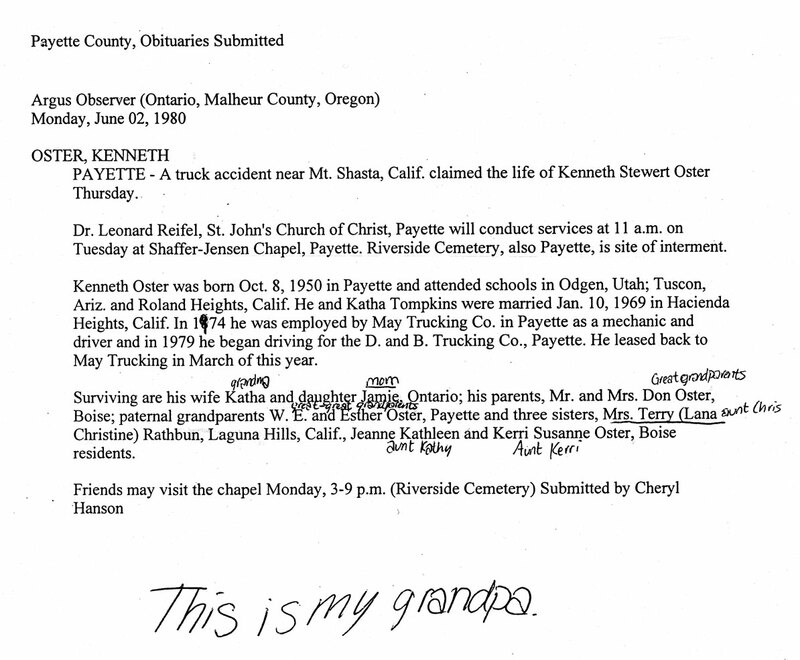 His name was Donald Kenneth Oster. 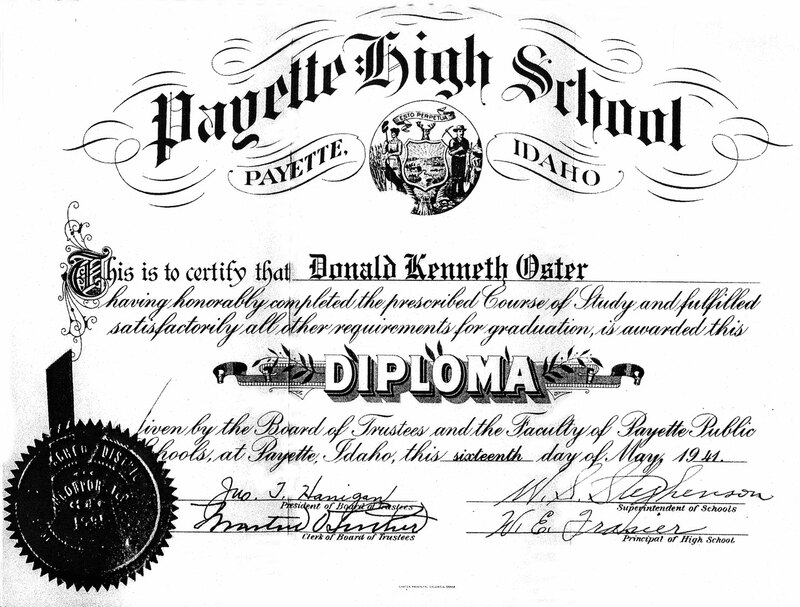 Donald was raised in Payette with his younger brother and graduated from Payette High School in 1941. He then went on to marry Bonnie Jean Bales and have four children. The only boy was Kenneth Stewart Oster. Kenny married Katha Tompkins and together they lived in California for a few years until Kenny finished his schooling for truck driving in Ontario, Oregon and brought Katha and their small daughter, Jami Kathleen Oster, to Oregon. Sadly, Kenneth passed away from a trucking accident near Mt Shasta California on May 29, 1980. Jamie grew up to Mary a truck driver herself, Darryn Thomas Goff. Jamie already had one daughter from a previous relationship, Tristan Amanda Oster, which Darryn adopted. 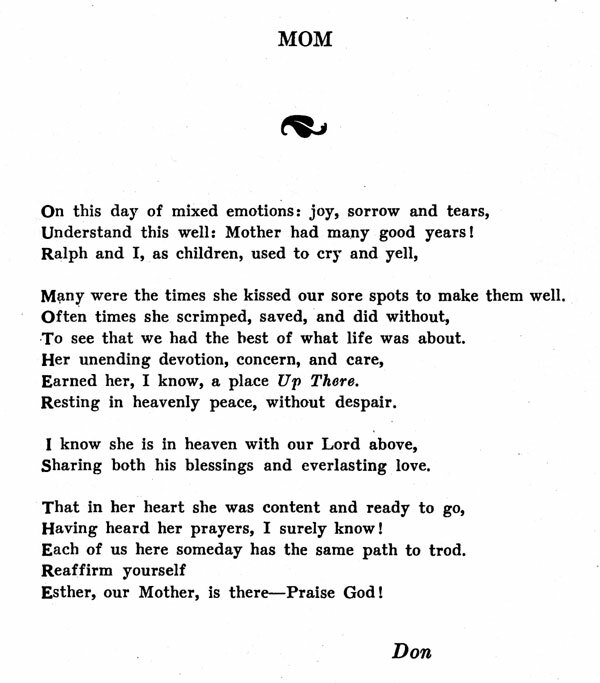 On September 10, 1990 they were happy to have a child of their own. I am that child. My name is Jordan Nicole Goff and I am pleased to have the chance to research the family I quite literally never knew. 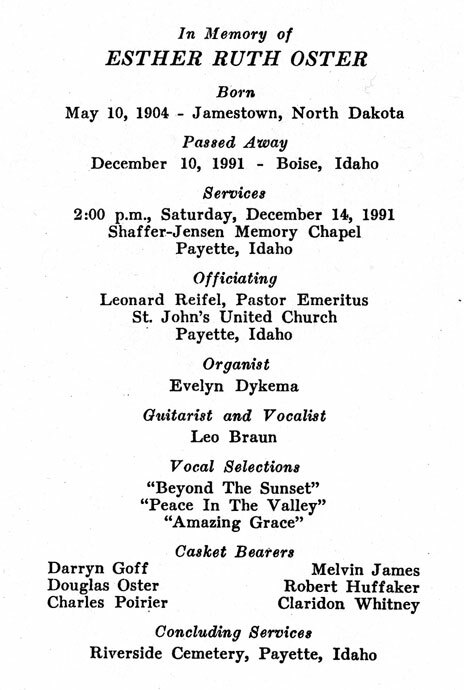 Wendlin Oster and his wife Esther were both registered members of St. John’s United Church Of Christ, Payette, Idaho. In fact, in the History of St. John’s Church, Payette, Idaho, 1898 to 1958, they are mentioned many times, all for very important things. In one of the first entries about the Osters it says how a new woman’s group was instituted in 1939. Esther was the treasurer for this particular group. This booklet also mentions that the Osters, Wendlin Oster Sr. and his wife, gave the church it’s altar in 1958. If you were to look at old newspapers or microfilm, in the Payette Independent you would find a section called North Payette. This section talks about everything from births to who went where this weekend. 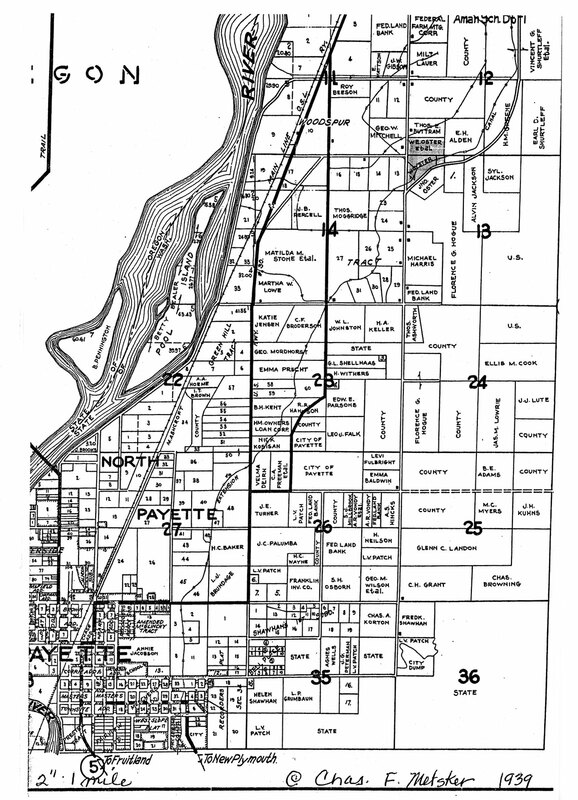 In the early days of Payette, with no TV or Internet, the news was printed in the paper. 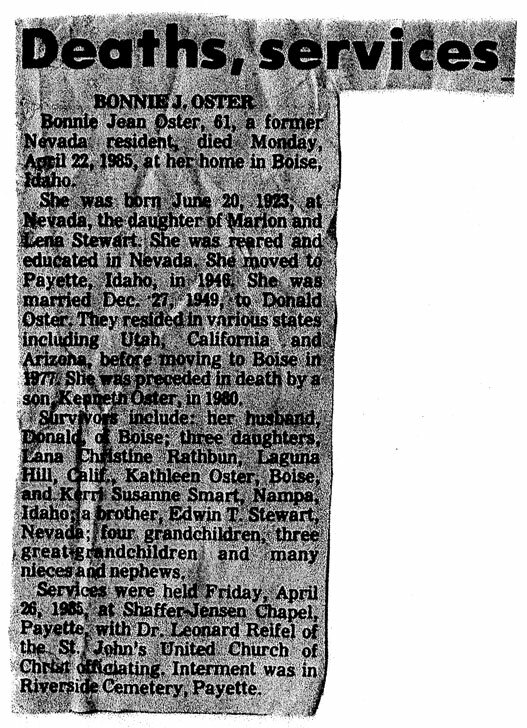 In this time, just about everything was news, including things such as; "W. Oster and his wife and Mr. and Mrs. F. Behr were visitors at the John Oster home the first of the week" as read in the Payette Independent on Thursday, March 8, 1923. 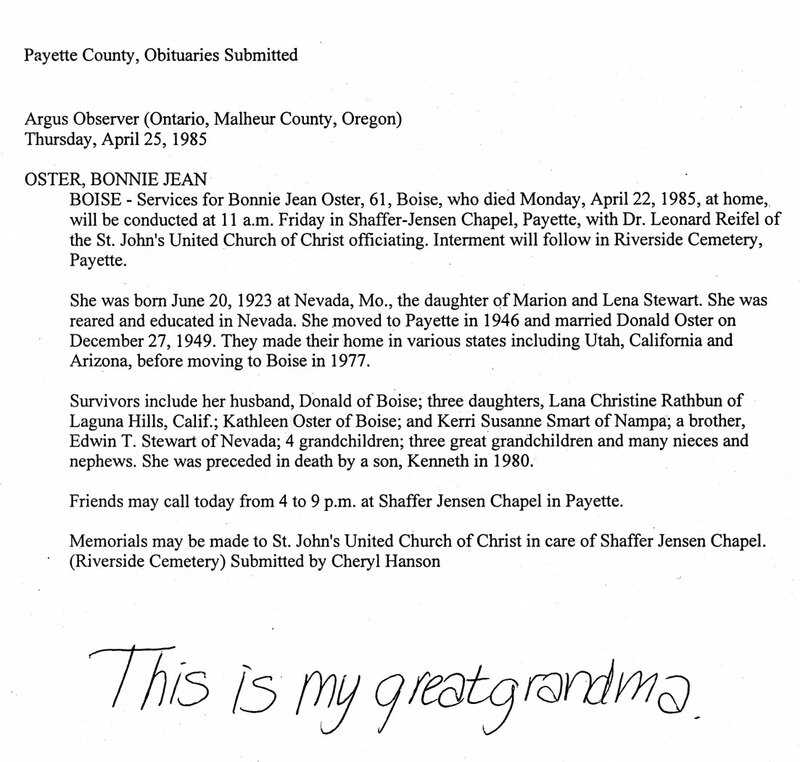 In just about every North Payette column the Osters were mentioned. This is because Payette, like any other town, started out small. Therefore there were not many people to write about and everything was news. To many people, Wendlin was a good man. "He was a great man. He worked the land with his hands and built a small plot of ground into what used to be one of the largest apple orchards in the valley. He was a hard worker and a loving grandpa." Says Jaime Goff, Wendlin’s great granddaughter. Wendlin is not mentioned in any Idaho History books, however Payette would not be the same without him. On July 4, 1977, that apple packing sheds in north Payette burnt down and Wendlin was on the scene to rebuild. Wendlin did not take for granted the little things. His parents were German immigrants and never had much money. So naturally they got as much use out of their items as possible. Wendlin learned that if he got a hole in his clothes he should patch it up and move on. This got him the nickname Patches. He was also known as Vinnie. He got this because with his parents having German accents, they pronounced Wendlin as Vendlin. And they shortened it into Vinnie. Wendlin was hardly ever called by his given name. 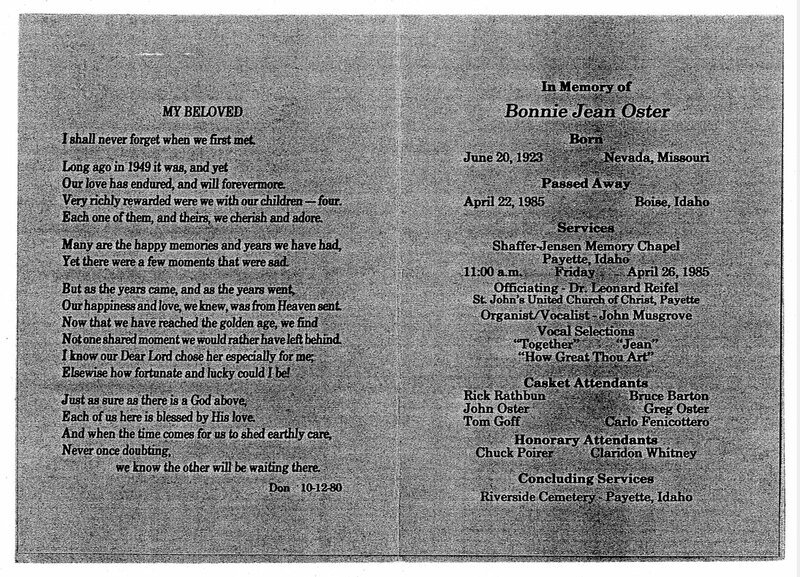 Donald Kenneth Oster ran a bar in the backyard of Wendlin’s land. This bar was called the Beacon Hall. The Beacon Hall was put to an end when Payette County outlawed the sale of alcohol outside city limits. 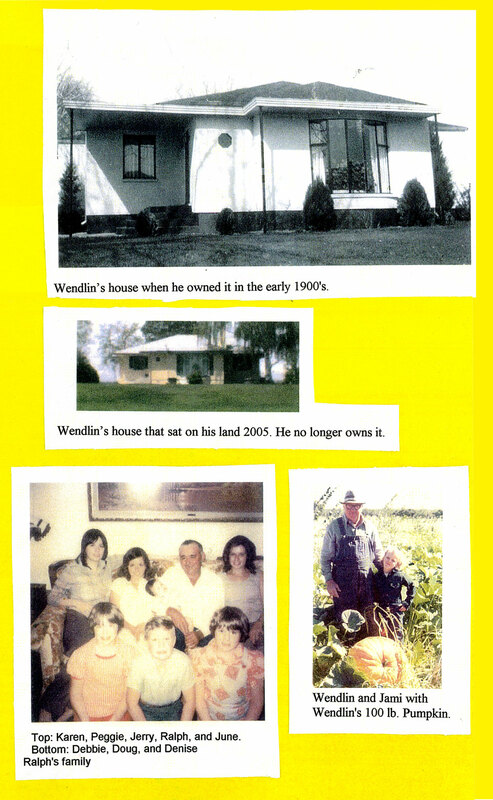 The plot of land that Wendlin owned was a family gathering spot. "I remember my childhood at the ranch, as our family called it, and I remember gatherings where others would tell about their childhoods at the ranch," says Jaime. Jamie misses the simple things about Payette that she will never see again. "The thing I miss most about Payette were its finer things. I remember going to the Bancroft Hotel when I was a child. It was a very beautiful place. I also remember the Whitney house that was on 7th Avenue. In the wintertime we would walk by there to lookup the Christmas lights they had. It always seemed magical and it let me know it was Christmas." I know my parents have tried to make times as simple for me as they were for them, however Payette has changed. The Bancroft Hotel has burnt down and the park that sits where it once was is basically a muddy lot of weeds. One of the only events the youth of Payette have to look forward to would be Apple Blossom Days. This event used to be called Boomerang Days because when the town of Payette started it was called Boomerang. When this festival comes around the people of Payette enjoy the festivities. We have a parade and a carnival and it is all kicked off with a night of spectacular fireworks. The Oster’s no longer own Wendlin’s land and most of the trees are gone but it still remains beautiful. Wendlin and his wife lived a long good life and raised their two boys to be great gentleman. Wendlin’s younger son, Ralph, had a large happy family. Ralph married a young woman named Carol and had two beautiful young girls, Peggy and Karen. Ralph and Carol split up and he later married June. She had three children and he adopted them, Debbie, Doug, and Denise. Karen married a man named Rick Cuoio and together they had a boy and a girl named Jerry and Sherry. Peggy married Carlo Sennicottero and they had two girls, Carrie and Catrina. Debbie married Calvin Castleberry and they had one boy, Jason. And Doug recently married Christine Gardener and adopted her little girl, Kicrah. I’ve only really known Doug and Denise. They were a big part of my childhood. My mother, Denise, and Doug were all wild children and I get a lot of my enthusiasm from them. My mom told me a story that really makes me laugh. I guess one time I was walking along the back of our couch as a baby and I fell. Usually my mother or Denise would have been right there to help me, but there was so much blood from biting my tongue, they didn’t know what to do. Doug was in the shower and heard my mom and Denise freaking out and came to the rescue, which is not like him. He cleaned me up and I still have my tongue. It is the things like this that make us who we are. I went to Doug’s wedding when he got married and he looked so happy. I can’t wait till that day comes in my life. I can’t wait to feel that happy, and to add another limb to our family tree. Ralphs brother had a nice big family too. 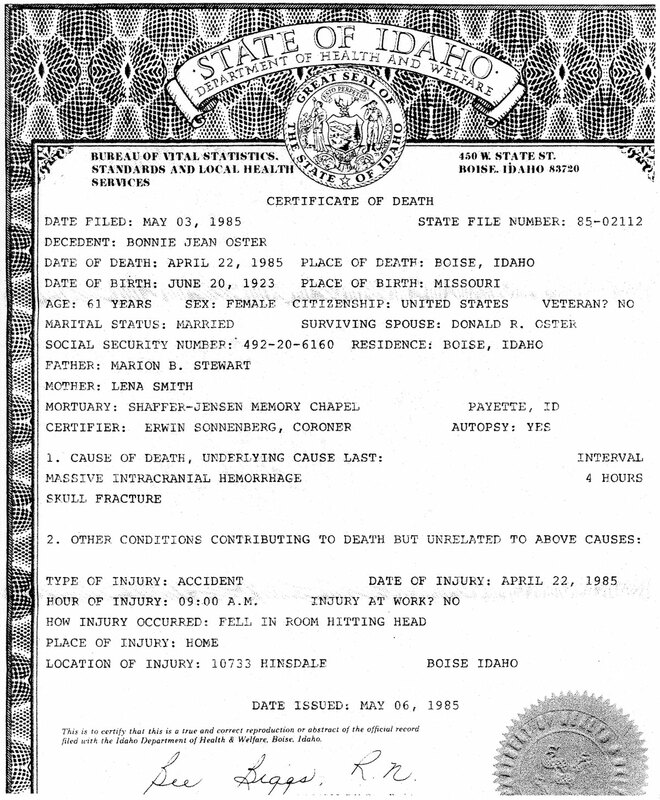 He and his wife gave birth to Lana (Chris), Jeanne (Kathy), Karri, and Kenneth. Lana married a man named Terry and they had three children, Rick, Wade, and Jackie. Jackie was adopted when a flood wiped out her village and Rick and Wade were Terry’s children. Jeanne had no children and Karri married a man named Phil, but they could not have children. I can remember going to see Aunt Karri and Uncle Phil when I was younger. They had really nice cats. They used to live near the cheese factory in Nampa and my parents would always buy cheese on the way home. We also used to go see Aunt Kathy (Jeanne) and she would sit my sister and I down in her living room and we would watch movies. I’ve never met Aunt Chris but I would like to one day. I guess even though I don’t have a record breaking family or any famous people in my family they were still great people. Wendlin, Ralph, Donald, and Kenny (the original Osters) are all deceased (R.I.P.) and I am happy to carry on with their blood in my veins. I am one of the few Osters left with true blood and I love that feeling. Until I have kids of my own some day, I am happy to say I am the youngest Oster that lives in Payette, the original American nesting place of the Oster’s, and I’m going to stay here because it is truly a great place to live. May their souls rest in peace in the holy heavens. 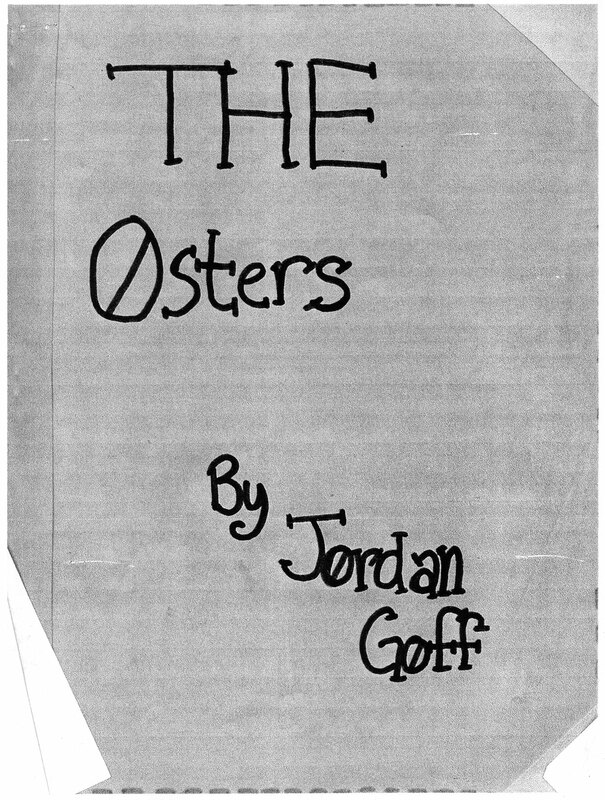 All research and interviews were done by Jordan N. Goff, a direct descendant of Wendlin E. Oster Junior’s.